Kiwis are surprisingly rich in vitamins and minerals, in particular Vitamin C, potassium and beta-carotene. 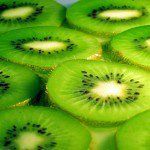 Kiwis also are an excellent source of flavonoids (Health Benefits of Kiwi Fruit). Studies published by the Archives of Ophthalmology have found that consuming kiwis along with other fruits can reduce the risk of developing ARMD (age related muscular degeneration) by 36% (Health Benefits of Kiwi). The high levels of Vitamin C, A, and E are responsible for protecting the muscles. The high levels of Vitamins C, E and A also protect against free radicals in the body. Free radicals lead to inflammation in the body which causes a multitude of diseases including cancer and obesity. Along with high levels of vitamins and minerals, kiwis also have a high fiber content containing 16% of the RDA for fiber (Hardy). The high fiber content can help to eliminated various diseases such as diabetes and colon cancer. Fiber also eliminated harmful toxins in the body. A high fiber diet also helps to lower cholesterol which reduces the risk of a heart attack. Additional health benefits of kiwi include regulating heart beats, treating asthma, providing 5.5% of the RDA for calcium, 8% of the RDA for copper, 4% of the RDA for Iron, and 6% of the RDA for magnesium (Hardy). Kiwis also help maintain fluid balance and keep teeth, nails, and skin healthy. There are no known side effects for consuming kiwi. Hardy, Alexandria. Kiwi and its Many Health Benefits. Super Kids Nutrition, 2007. Web. 2 Jul 2012. Health Benefits of Kiwi Fruit. Kiwi-fruit.info, 2007. Web. 2 Jul 2012.